Well, maybe we won’t actually get to the final dragon before the end of the series. This episode stretched on a bit longer than I expected and, while I generally enjoyed it, Akatsuki no Yona‘s best moments don’t come from high stakes, life-threatening situations, but from the interpersonal relationships of its characters and their respective ways of seeing the world—and nowhere was this more evident than in the final scene between Hak and Yona. 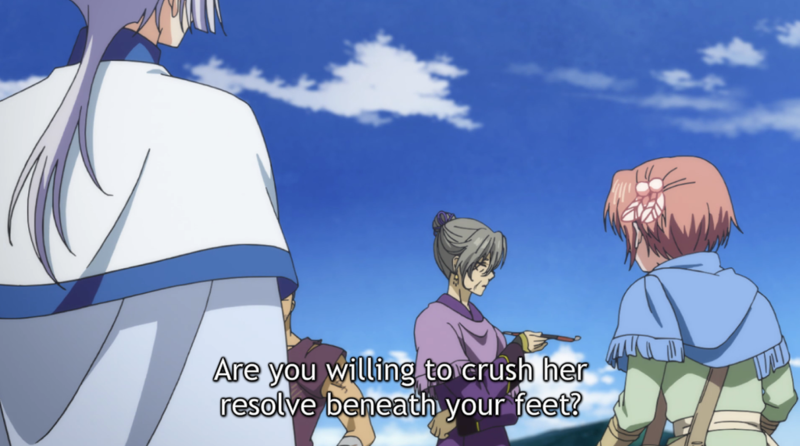 As far as dragon recruiting goes, Yona’s apparent helplessness on the cliffs appears to have done some important work in continuing to deconstruct Jaeha’s perceptions of what the reincarnated King Hiryuu would be like. 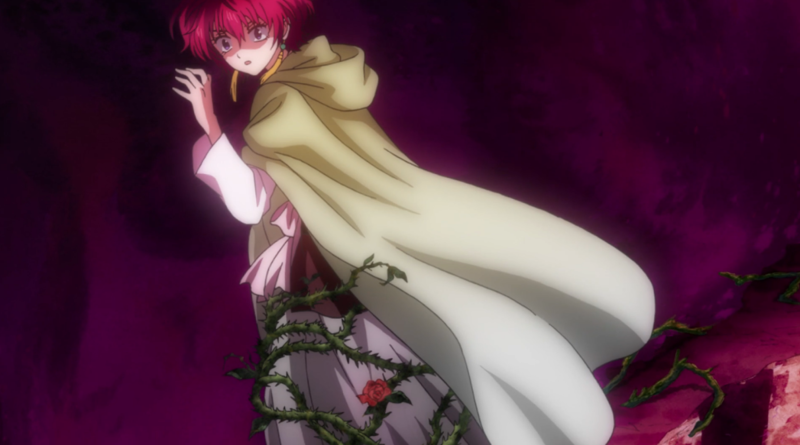 Hearing the majority of the scene through Jaeha’s perspective also lent a certain power to Yona’s determination through his unceasing internal arguments. “It’s okay,” Yona says. It’s not okay! “I have to do this simple job.” It’s not simple! You’re only a powerless girl! But what is power? 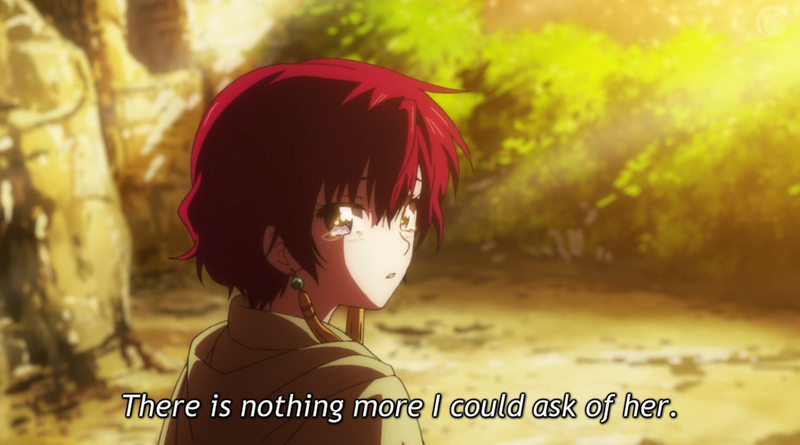 Akatsuki no Yona has been rubbing up against this question almost since the beginning of the show, contacting with it every time Yun is on screen, and always probing the nature of Yona’s strength. 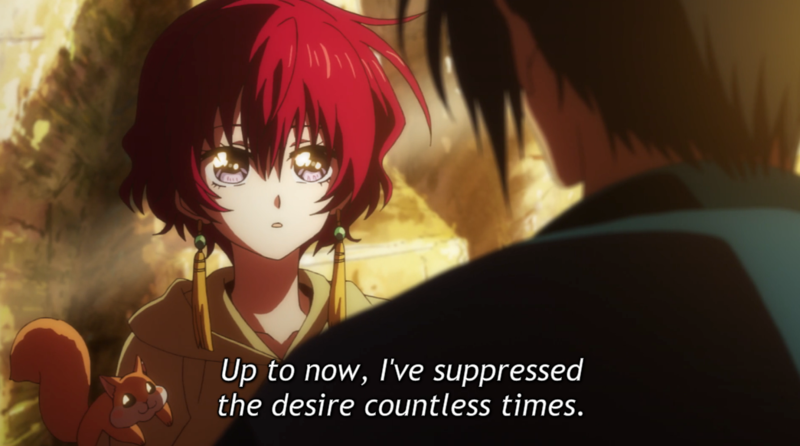 As Jaeha watches Yona move forward on shaking legs, he wonders how she can do it despite her lack of power. But that’s just it! 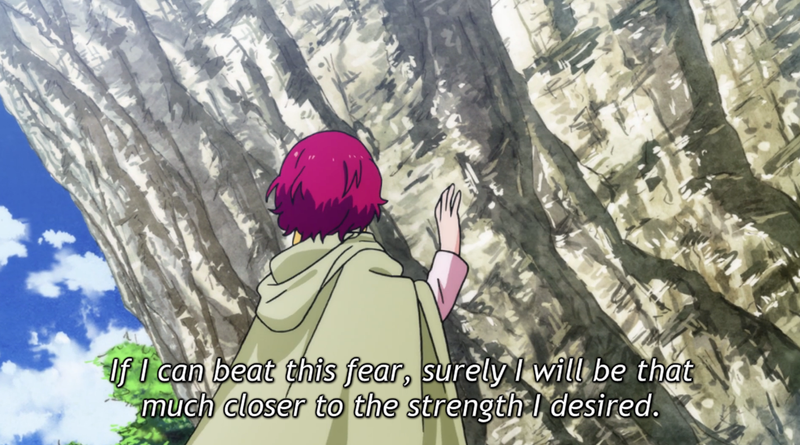 The ability to move forward in spite of fear and in spite of a body that wants to turn back is the core of Yona’s strength: bravery. 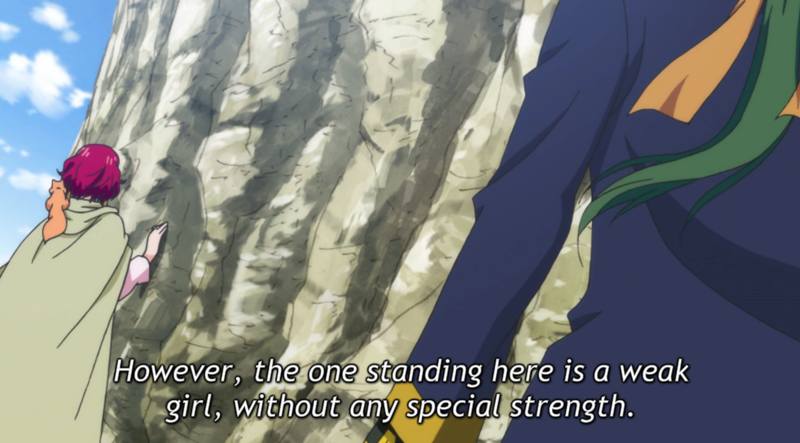 Physically, she might not be able to fight on the level of Hak or the dragons, but there are other kinds of strengths. It’s also interesting to watch Jaeha struggle with his pride and desire to remain free in the face of a competing impulse to be with Yona. 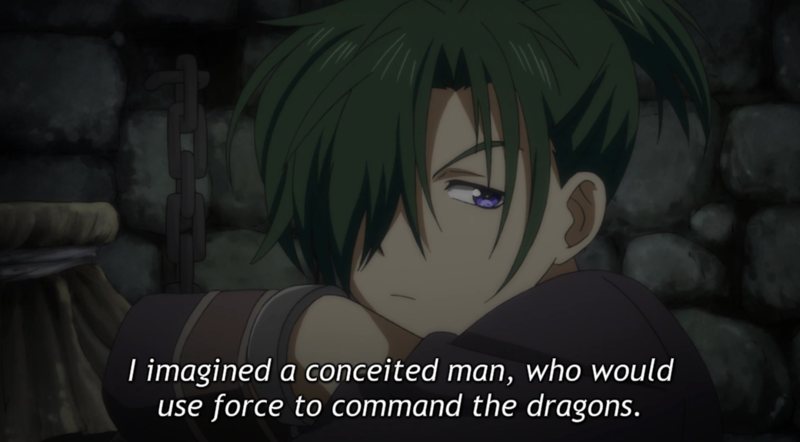 It’s pretty obvious by this point that there’s more than just his dragon blood pushing him to join Yona, and the more he seeks to attribute that motivation to an external locus of control, the more it becomes apparent that no, it is Jaeha himself who wants to follow Yona, to follow someone who’s strength lies somewhere beyond physical and military prowess. Like Hak, his constant teasing of Yona seems to belie an emotional reality he’d rather not face. 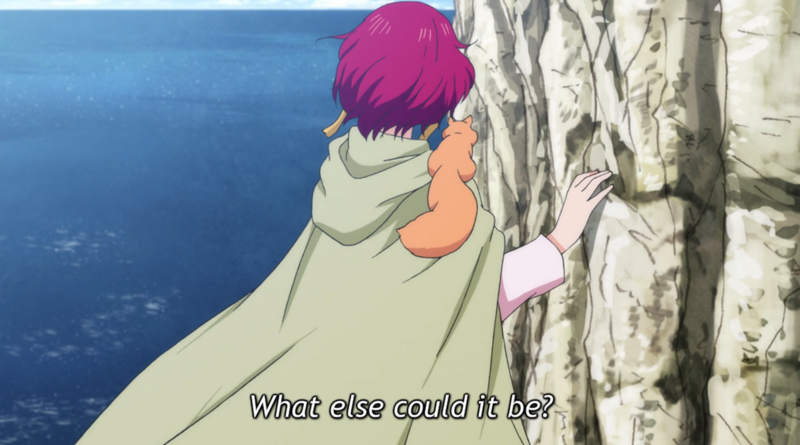 And, really, that’s all there was to the generally insubstantial half of the episode focused on Yona’s cliffside task. Once again, it’s Yun who runs to her in tears after her return, and both Sinha and Ki-ja stick quite close to her after she hands over the healing herbs to Gigan (who has an amazing laugh courtesy of Yoshiko Sakakibara). Whether she or they realize it, Yona’s the heart of their party—even apart from her status as Hiryuu’s reincarnation and master of the dragons. It is, once again, just another demonstration of Yona’s non-traditional methods of power. Understanding, tenacity, authenticity, bravery, purity of spirit. 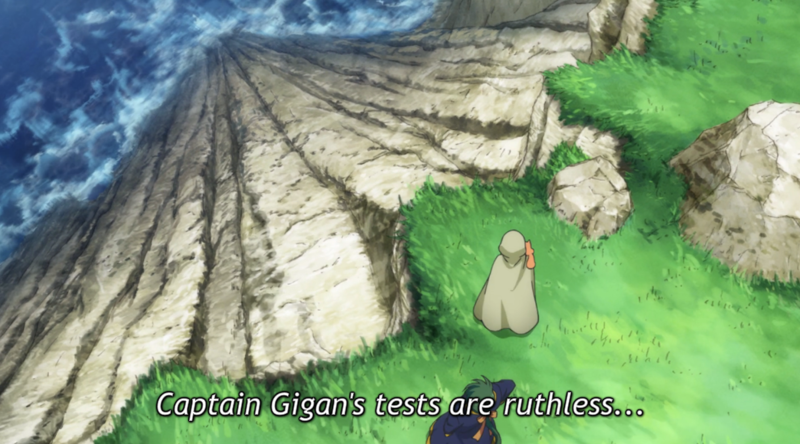 Captain Gigan’s acceptance of Yona on the basis of Yona’s honesty about the events on the cliff—loyalty, not strength, is what she was evaluating—are just another validation of Yona’s strength. But then there’s Hak, standing quietly as he watches Ki-ja’s hilarious lecturing of the pirates. His anxiety is communicated almost exclusively through his facial expressions and body language, non-verbal cues Jaeha appears able to read like a book. For us in the audience, who have been watching Hak and Yona for even longer, it’s clear Hak is nearing a breaking point—one he very nearly reaches by the end of the episode. Jaeha’s not the only one suffering from the internal tension of competing impulses. The justification most often given by Hak for protecting Yona—King Il’s orders—may very well be a true one, and a reason he thinks of often, but…Hak is very, very human (a fact highlighted by the fact that he’s surrounded by other men in possession of supernatural powers). Can Hak be expected to deny his own desires forever? But, by the same token, can he really expect anything more from Yona at this point in her life? Sure, he’s given up everything to protect her, a fact Yona herself recognizes, but she is still a princess with a murdered father on the run from a kingdom and former lover who want her dead. Does she have room for romance in her life right now? I don’t think so, and it seems Hak realizes that as well. “She can live free,” he tells himself. 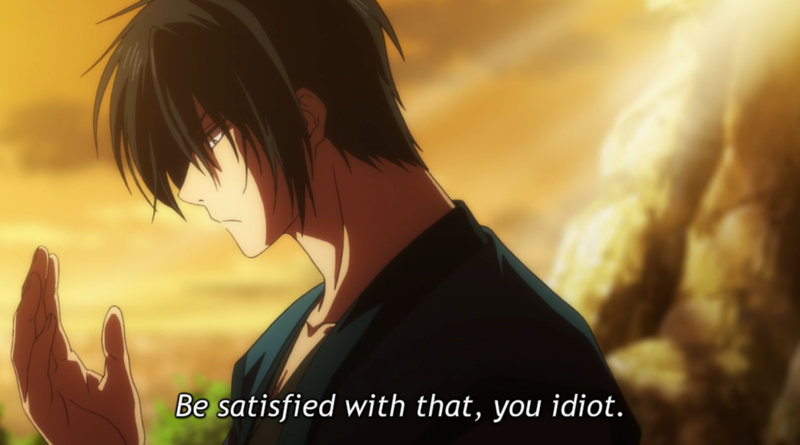 “Be satisfied with that, idiot.” But Hak has spent the last 19 episodes giving and giving and giving to Yona, ignoring his own feelings and his own desires to ensure that his princess is enabled to follow the path she chooses. Somewhere along the line he will have to figure this out, or it might very well destroy him or cause him to destroy himself. It’s not as if Hak feels he deserves anything from Yona—this isn’t a man whining about being in the friendzone—he makes that explicitly clear. But he is still a man, one who can’t help caring about the girl he loves and one who can’t help but want more from his relationship with her than what he has. I loved that the whole honey scene was colored in the warm yellow tones of the sunset. 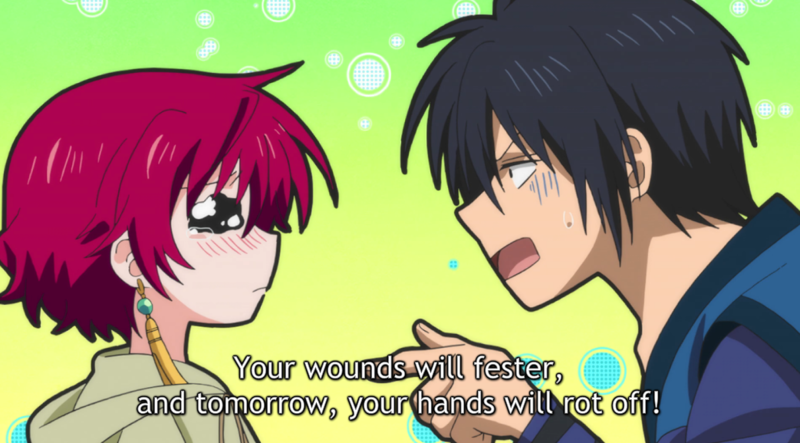 The moment when Hak pours the honey over Yona’s hands is an incredibly intimate and tender one—sweet, one might even say. But it’s also quite primal and instinctive, and the use of honey as a medium for that aspect of the scene (Hak’s a Thunder Beast, remember) serves to highlight the tension between Hak’s noble intellectual motivations and his physical-emotional ones. Heh, look at that. It took most of the episode to get there, but we got another fantastic dualism cropping up in Yona this episode after all! 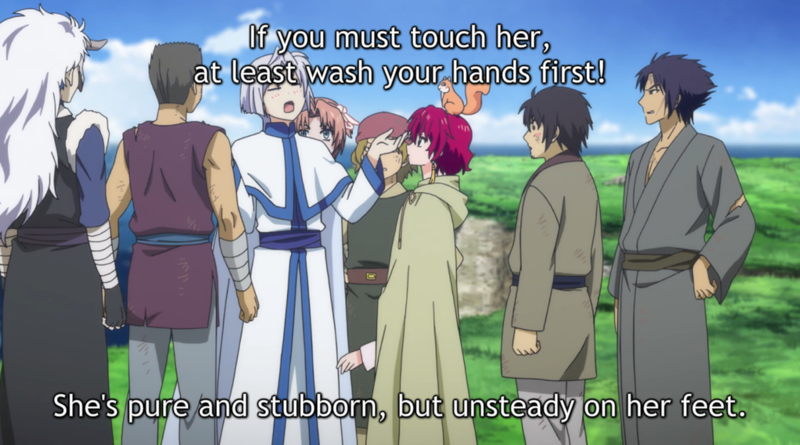 I really like the Hak-Yona romance. Most other shows tend to over-emphasize the romance, if there is one. Or they ignore it for the most part, except when they actually decide to have a romantic moment. This show understates it, while still providing many small moments. It’s a really good balance. Yeah, they do a really nice job of reminding us that it’s there without understating it or overstating it. Plus, in this very much not realistic scenario, it seems like a realistic way to handle a romance like this. Don’t worry we will get to the last dragon lol. I won’t say much more than that. 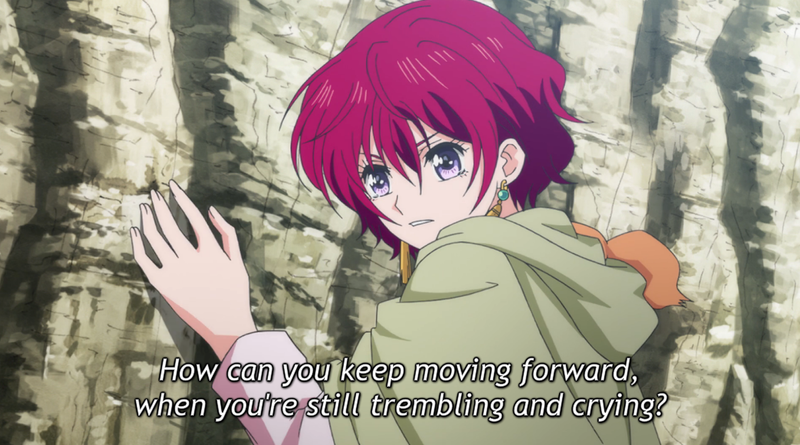 I loved the scene where Yona is trying her best to keeping moving forward despite being scared which has been the entire theme of this show when it comes to her character arc. This arc in general is one her best moments yet and you will not be disappointed. As for Hak you have to feel for the brother. I love that he does not complain about being friendzoned and instead supports her decisions in order to become a stronger individual who wants her to stand on her own two feet. 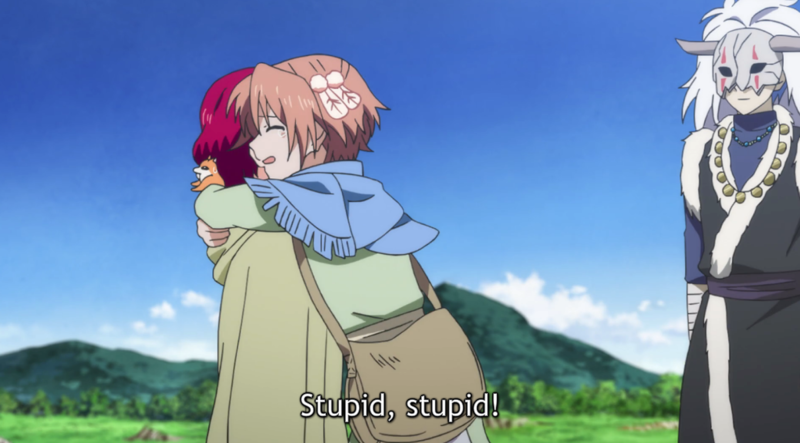 However its been noted several times he has loved Yona ever since they were children and its was really subtle here but I think its also important to mention Su-won appearance in Hak’s flashback in this episode. As much as he loved Yona he also loved Su-won and was willing to step aside and let the two of them be together. We have seen Yona’s grief over the betrayal, but we have yet to see how Hak is dealing with it and if he is keeping it all inside i don’t see that being healthy for him in the long run. He needs to properly deal with it. As the saying goes, “Bravery is not not being afraid. It’s moving forward despite that fear.” I’m very much looking forward to Yona’s continuing role in this conflict. I expect she’ll have to kill an actual human being before the end of this & I think it’ll be an important moment. And ohhhh yes, Hak’s internal conflicts run very, very deep. I mentioned King Il and his personal feelings towards Yona in this post, but the whole Su-won issue is yet another beast he has to deal with. He’s certainly under a lot of pressure from a lot of different places & I do honestly fear he’ll crack sooner rather than later. Much as I detest the new OP, there’s some interesting foreshadowing in the footage, including what I think is Yona’s first bowshot in anger on the boat. For another show? Maybe. It might have worked to replace Database for Log Horizon now that I think about it. But for Akatsuki no Yona? NO. JUST NO. I agree. The music itself is good, but it doesn’t fit for Akastuki no Yona. Agreed (really wished they kept the more traditional music of the opening insted of reverting to J-pop stuff but the new end theme is rather nice). The Hak and Yona honey scene pains me. Even though it portrays something important, even though their feelings are very much likely to be mutual, even though its supposed to be a really sweet scene, it still hurts. At least there are Ao’s antics to ease up the uneasiness. I’m almost convinced that Ao is there for Yona and Sinha as much as it is there for us the audience. Is it because it’s an intimacy that really can’t happen right now? They’re somewhat in the middle of a war—is there really a place for them to fall in love right now? Ao does do a lot of good for this show. I very much like the relationship he and Yona have forged. Exactly. To be in love with each other but have to suppress their feelings, it hurts them. I admire how Yona does not give in to her romantic feelings towards Hak. Diluting her determination to achieve her goals and desires probably hurts her more than anything. I have to admit, I didn’t particularly like this episode. I think most of what was actually covered could have been gotten through in about half the time, while the real significant moments were mostly relegated to the background. And while I don’t have anything against the Yona/Hak romance and realise it can’t be put off forever, I don’t think this was the best time to draw attention to it – in a way that felt almost gratuitous at that. I do agree. The cliffside sequence, in particular, dragged on much longer than I thought necessary without much real dramatic payoff. I definitely understand what you’re saying about the timing of the Yona/Hak scene, although I sort of felt like the abruptness and relative unrestrained nature of the encounter fit quite well with how Hak is feeling right now. I just… it wasn’t even really the abruptness that seemed the most ‘off’ thing about that scene between Hak and Yona as much as it was the obviousness of it. 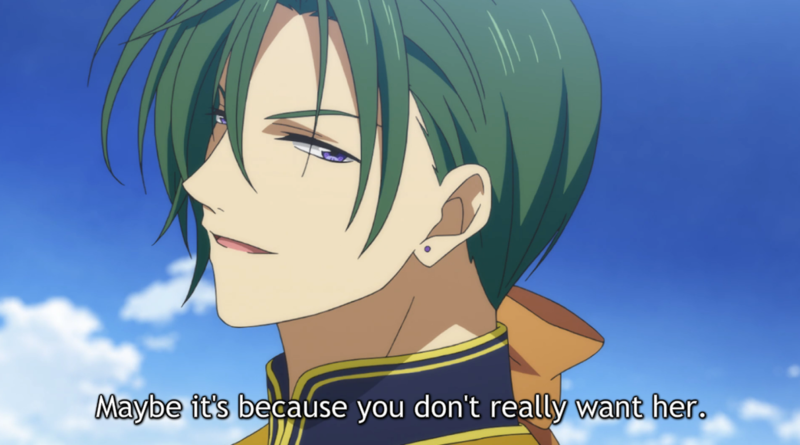 The show has, for the most part, been fairly understated until this point – in particular, it’s kept pretty much any and all romance-related content quite subtle, which is exactly one of the reasons why Akatsuki no Yona isn’t some cheap or over-the-top drama. Yet here we have a scene that’s not only ridiculously unsubtle but also blatantly sexual in nature. It was unnecessary, and more importantly it felt completely at odds with the whole tone of the rest of the series. I honestly hate to be so harsh on a title that I still really like and respect, but there it is. I just fall in love with this show over and over. Captain Gigan is definitely Best Girl for this season. Best Post-Meopausal woman? She is fantastic, and yes that slightly phlegmmy laugh is great. I thought her dramatic pose at the end of her little speech to Yona looked a bit dumb, but otherwise she had another stellar episode. I don’t know if I’d call her Best Woman (not sure she’s had enough screen time for that), but there’s no doubting that she’s a great addition to this story’s cast. Well said. It finds its power in its subtlety. That honey scene was kind of saucy… I had to rewind it to make sure I was seeing right. I do agree with your description of the characters’ internal struggles and what you described is what makes Hak the most compelling character to me. It doesn’t have to always be some convoluted complexity. Just set up two really opposite dualities and watch the bullets fly as they war to dominate the character’s motivations. Hak is very beast-like but he is also very self-controlled, a fascinating combination but how long can he hold up with everything going on?